Conservation Errors and Number of Owners Impacted? How would you feel if your home were suddenly designated as conservation on the FLUM….? 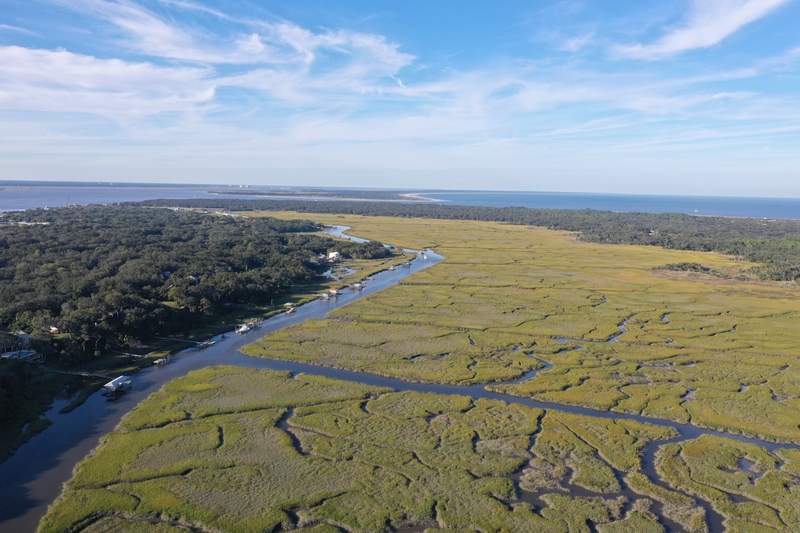 How would you feel if your home or land became conservation on the Future Land Use Map? Think about it! 4 properties show up on the property appraiser’s GIS system with conservation and a sliver of our homestead is also crossed by the line. I feel the designation is an error and I intend to ask for a correction. I want to know who made the error and why the homesteaded properties were designated. The FLUM lines have no connection to ownership, topo lines or wetland lines. I was told the CoFB has no intention of addressing other errors and only intends to consider the current property with so much recent opposition, Amelia Bluff, on Citrona. Why would we not see a correction of all 4, 5 or “SEVENTY” properties with errors? 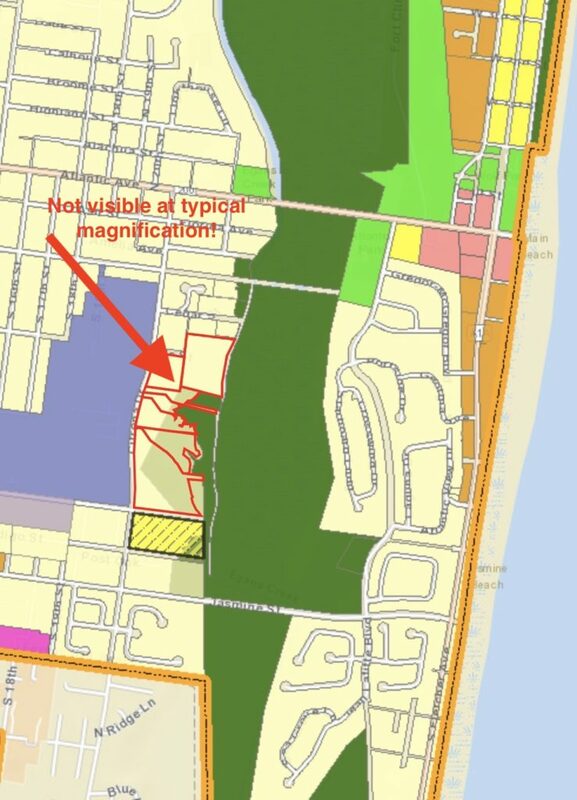 In looking at the GIS maps from the Nassau County Property Appraiser’s website, I see a number of properties with a potentially erroneous conservation designation on the Future Land Use map. It is, perhaps, worth asking a question. Why are “ALL ERRORS” not being voluntarily corrected? One property on this map may actually have a home crossed by a FLUM conservation designation line. Does this owner need to worry? I would like clarification and I want to know how this happened. 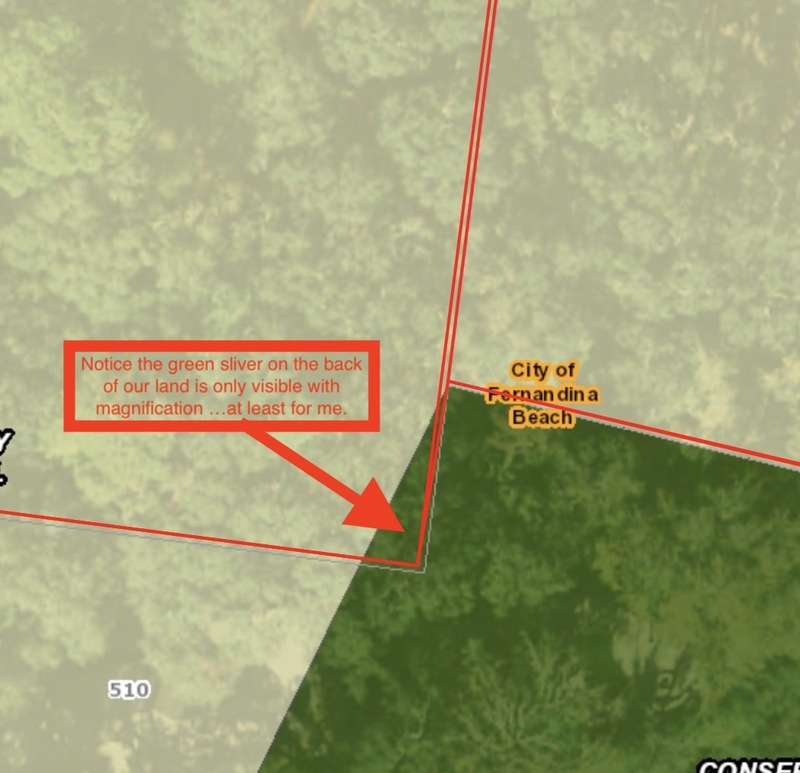 As enlarged as this map may be, I wouldn’t see the line potentially crossing a few feet of our back property line, without aid of the GIS system….hopefully accurate and “to scale”. Below, you’ll see a piece of conservation FLUM, with Conservation designation, crossing the back of our property, “ONLY VISIBLE WITH AID OF MAGNIFICATION, GIS”. Reasonable? Not in my opinion! The last embedded video you see includes discussion at the March 13th PAB meeting related to as many as 140 properties with inconsistencies. My particular concern is in one PAB member’s comments related to an erroneous map ruling over the zoning and also, I have an issue with comments suggesting handling this privately….or out of the sunshine? See comments by Member Frank Santry at about the 6 minute mark. Recent confusion over the differences in zoning and future land use, seem to have stirred the community pot. Living near the greenway, I’m aware of previous errors in zoning to conservation. The intent of acquiring greenway was to create land with conservation zoning or future land use. Some adjacent properties were not acquired as a part of the greenway, but somehow were changed in error and that error appears to have carried over to the future land use map as well. 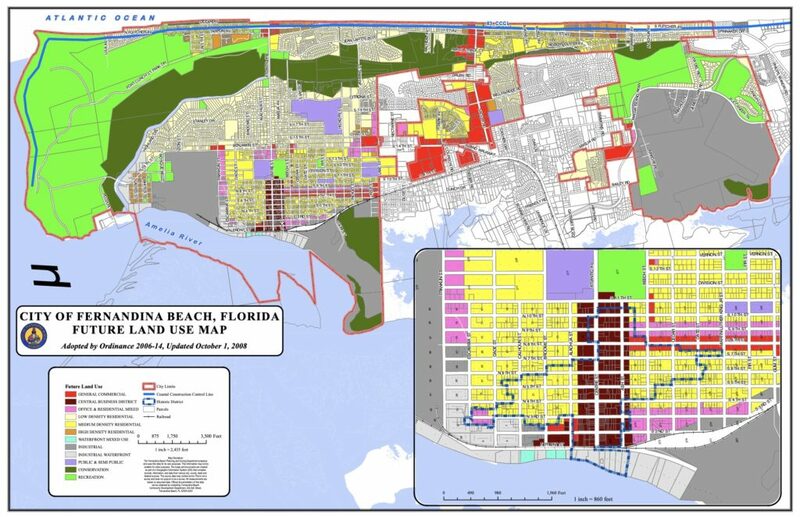 Anyway, the drama over this change continued as those unaware of the original reason for the zoning or how land changes to conservation, questioned the development of land zoned for residential use, but still showing conservation on the “FUTURE” land use map. It helps to know the history and look at the dark green areas on the map above. See the link and full version, if you’re curious. 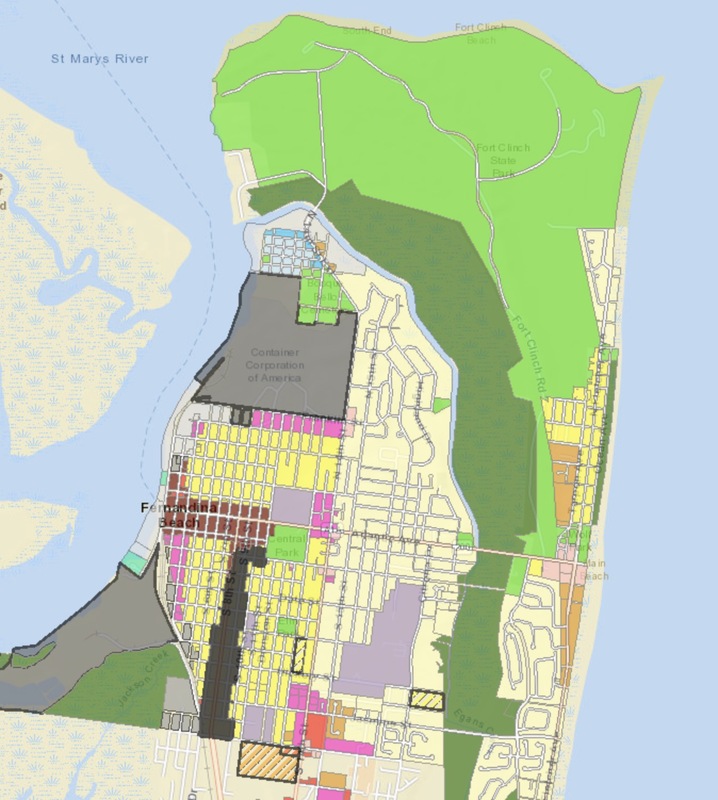 The light green and dark green areas are quite large, but seeing properties from ground level can make it difficult to understand just how much natural space we have on the island, preserved with recreational or conservation zoning. Future Land Use Map Snippet…. Approval of a small-scale Future Land Use Map amendment is requested for 6.40 acres of land from Conservation (CON) to Low Density Residential (LDR) to correct a scrivener’s error and for consistency with the zoning map reflecting R-1(Low Density Residential) zoning. The applicant requests consideration of the FLUM amendment to make consistent the maps and proceed with final plat approval for the 30-dwelling unit subdivision located on a total of on 11.71 acres of land. 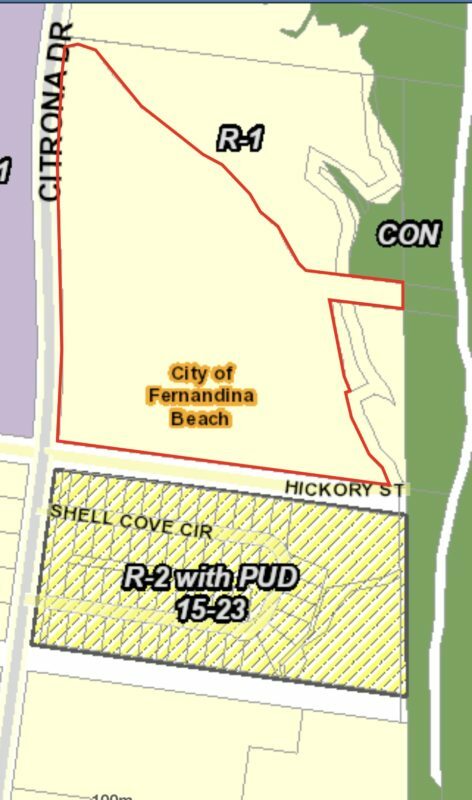 The subject property is located on Citrona Drive between Hickory Street and Fir Street and identified as “Amelia Bluff.” The developed density of the site is proposed to be 2.56 dwelling units per acre. Existing uses surrounding the property are described in the preceding section. Two points of ingress and egress will be located on Citrona Drive, pending approval of Nassau County for roadway access. In 2017, the City vacated a portion of unopened right-of-way (Ordinance 2017-25) known as, “Gum Street”, which ran through the mid- section of the site. The City and property owner entered a Memorandum of Understanding (MOU) (Resolution 2017-123) which stipulated certain criteria be met as part of any land development approvals. 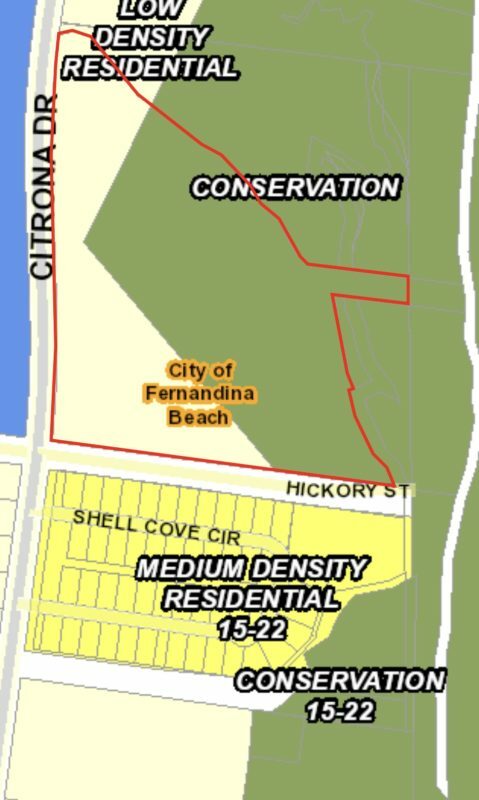 The wetlands portion of the property totaling 3.63 acres of land was transferred to the City of Fernandina through a quit claim deed on March 20, 2018 (Resolution 2018-39). 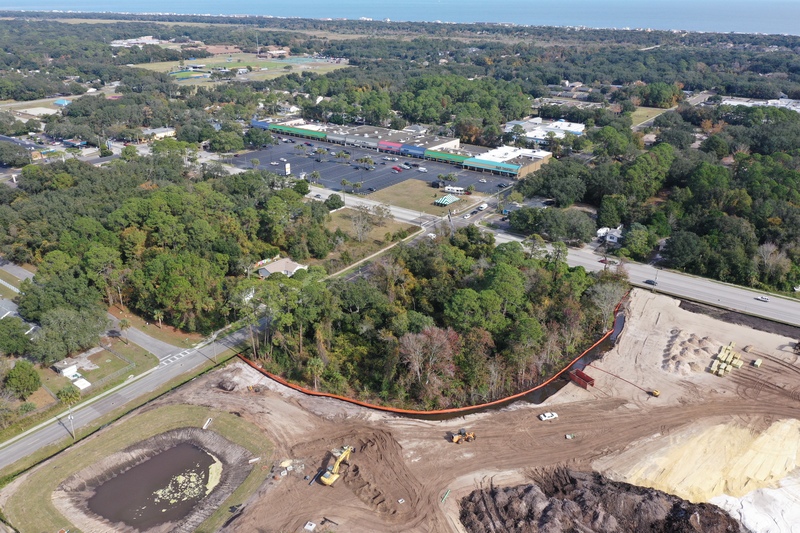 Access to the abutting properties under ownership of the Florida Department of Transportation and located on the eastern edge of the property was established through the creation of a public right-of-way under Resolution 2018-40 on March 20, 2018. 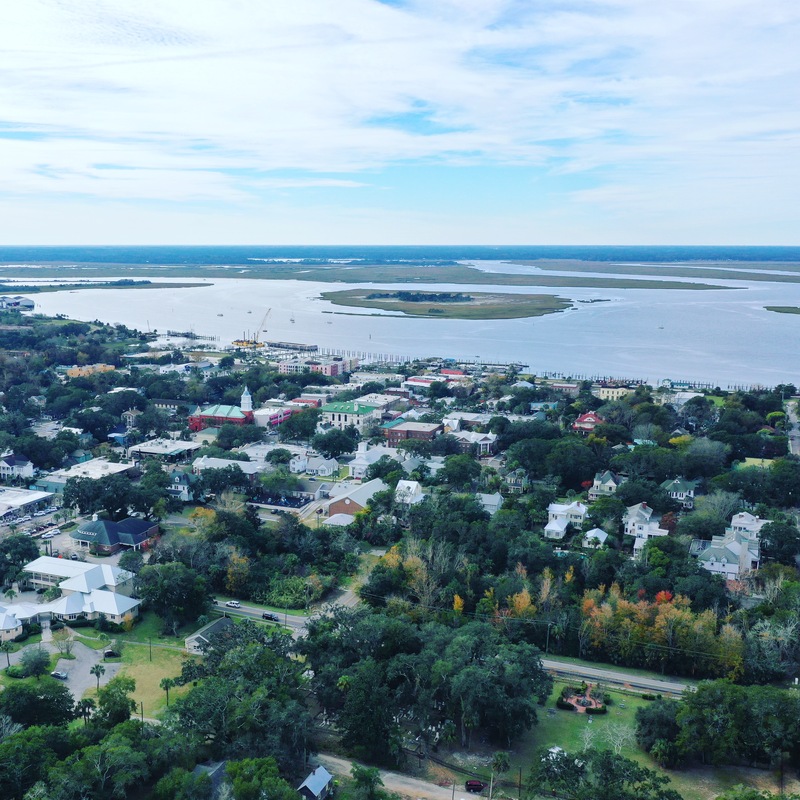 The City Commission approved the Amelia Bluff preliminary plat through Resolution 2018-64 on May 1, 2018. Site work commenced in May and infrastructure improvements have been installed. The City will inspect the roadways and infrastructure improvements and the required maintenance bonds will be received at the time a final plat receives signatures from City officials. 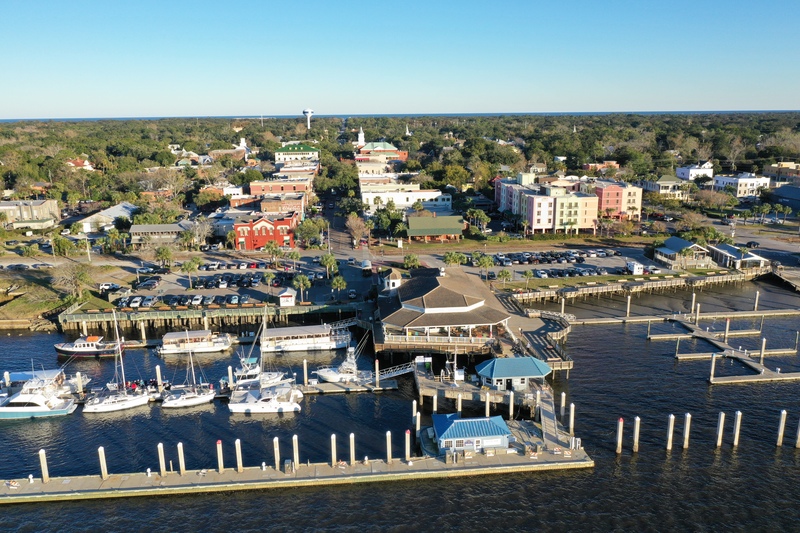 Due to damages caused by Hurricane Matthew and the pending repairs, Fernandina Harbor Marina will close Friday, November 23, 2018. This will include dinghy, short term, transient docks, the mooring field and the boat ramp. 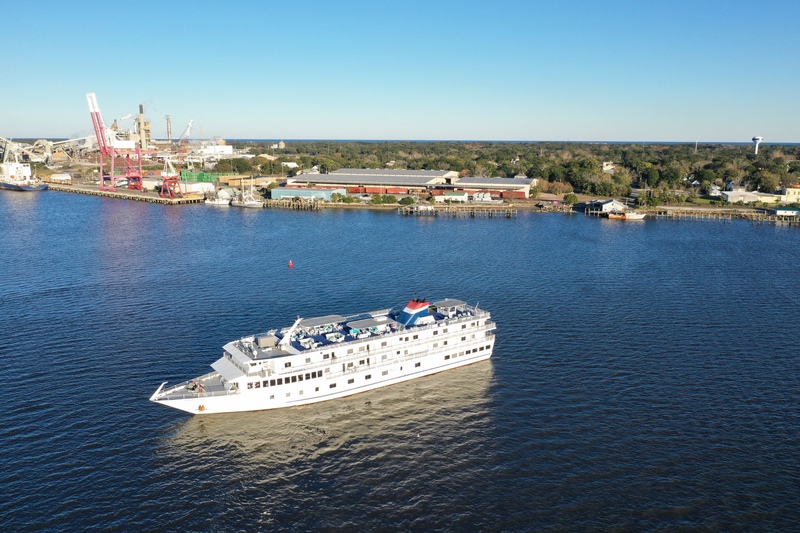 The marina is scheduled to reopen Summer 2019. Staff is on site from 8:00 am to 5:00 pm. PART 1. The marina is still without the use of the wave attenuator. This includes the fuel dock, pump out and large vessel dockage. Bids were published for the repair/replacement of the wave attenuator and a contract is in place with Fender Marine. Mobilization is schedule for later in November and work is expected to last until June of 2019. PART 2. The Southern Basin Reconfiguration and Dredging is also on schedule. The City Commission awarded the bid to Brance Diversified. 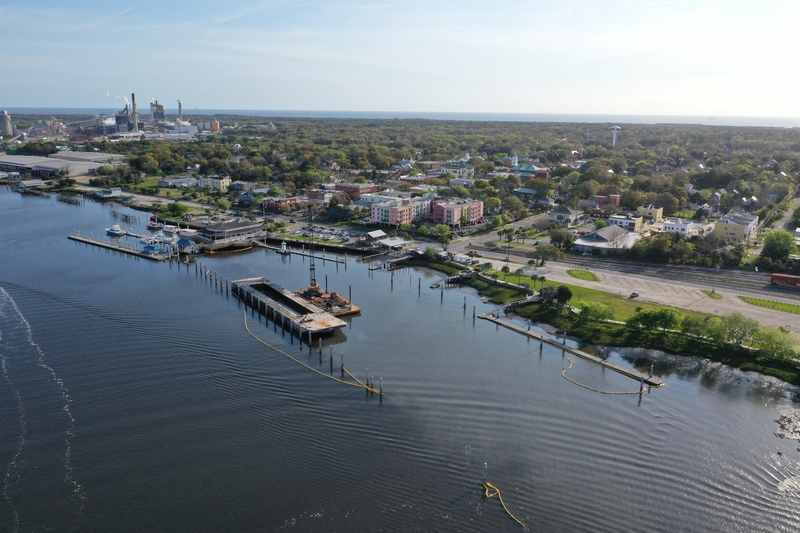 This work will include the removal of docks form the southern basin, the dredging of the southern basin and the installation of new docks that will follow a north to south alignment. This reconfiguration is expected to minimize siltation and prolong the period between dredging project. Brance is scheduled to mobilize later this month and work is expected to last until April 2019. PART 3. The marina will be closed to transient, short term, dinghy and mooring dockage starting November 23rd. Earlier in the repair process…. Paid Parking and Now, Later or Never? I’m going to try to avoid the question and briefly talk about my view of paid parking schemes and beach access. While I dislike paid parking, when I’m paying, I also understand why this may eventually become necessary. When there are not enough spaces to supply the community need, someone will be denied access. Are we at that point? Should we ever consider parking as a revenue generator? In my opinion, we aren’t at that point, but the day is approaching. Our current commission is, once again, approaching parking from the revenue generation point of view. Seeing a gate to accessing a resource like the beach as a revenue tool, in my opinion, eventually leads to future potential for waste. It is fairly easy to add a tax, creating a cost to access, but difficult to remove a tax. I would prefer to see parking control (time limits) as a way to recirculate vehicles or insure access to parks, restaurants and activities at Main Beach, assuming we’re talking about paid parking at Main Beach. The picture below is from earlier today at about 3:45PM. It was overcast and cool out, but you can see available space. Restaurant use would peak in the evening and beach use should peak in early afternoon. 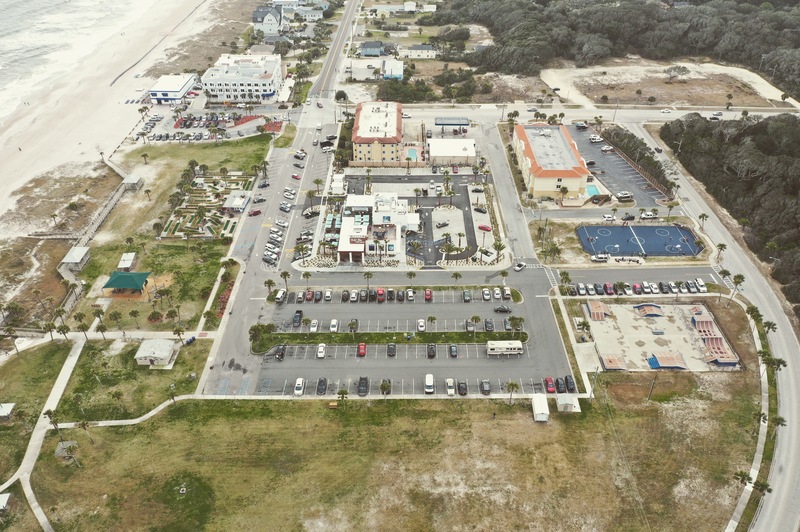 The variety of uses will increase use of the park, but before Salt Life or an improved Sandbar/Salty Pelican, businesses like the PuttPutt were not quite as busy. Sooner or later, we will see increased control of parking as the population increases west of the bridge. I see this as a mixed blessing, with tourism dollars and revenue from daily visitors making improvements on the island possible. I would say to anticipate the eventuality of parking controls, but please try to avoid seeing any kind of parking control in terms of revenue generation. Companies specializing in providing equipment will justify charging for parking. The justification….if it happens in the rest of Florida, it must be a great idea. As a former commissioner, I would say politicians are not usually great stewards of tax dollars. The stakeholders in parking are the public using the park, but also the businesses dependent on reasonable access. Both the public and surrounding business will ask or beg for help when the time comes. An interesting and rare sight will greet you on a drive along Front Street. 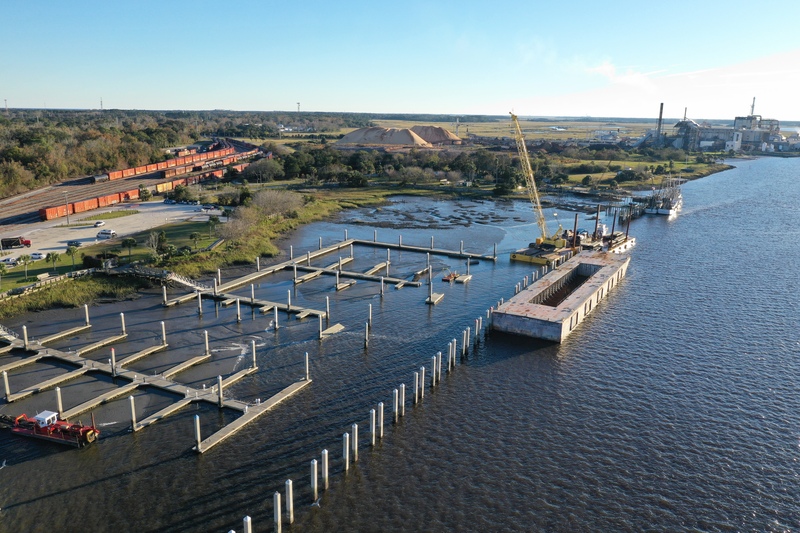 These cranes are replaced infrequently and funding was a result of efforts by two economic development advocates…..Sen. Rick Scott and State Sen. Aaron Bean, working on our behalf. Thanks as well should go to Laura DiBella, Economic Developement Director and Port Director. Worldwide Terminals Fernandina (“WTF”), working in partnership with the Ocean Highway and Port Authority of Nassau County (“OHPA”), are pleased to announce that they have closed on a $2 million Bridge Financing Facility with BRANCH BANKING AND TRUST COMPANY (“BB&T”) for the acquisition of a Liebherr Mobile Harbor Crane (the “Crane”). This purchase will include all necessary attachments including a state-of-the-art container spreader, as well as, onsite training. The actual funding for the Crane was the result of a $2 million grant authorized by the Florida State Legislature, approved by Governor Rick Scott, and funded through the Florida Department of Transportation (“FDOT”) to the OHPA, and was the result of diligent efforts by State Senator Aaron Bean and State Representative Cord Byrd. 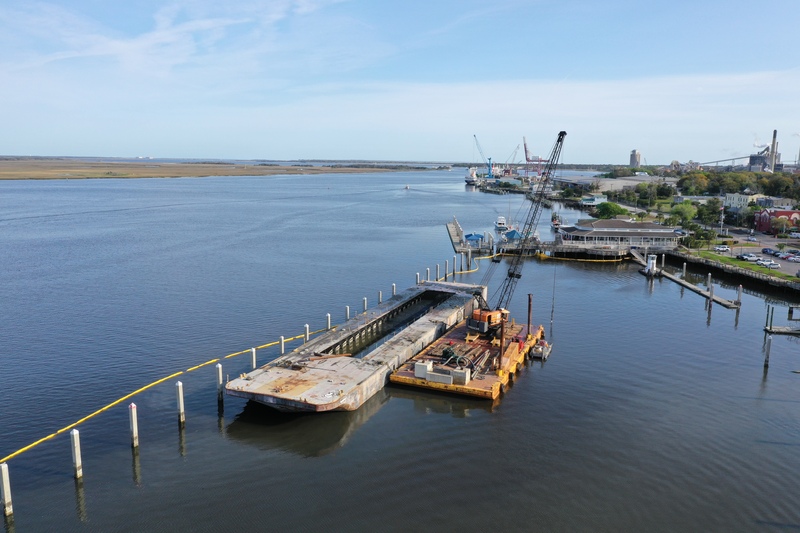 The bridge financing provided by BB&T facilitates the purchase and delivery of the Crane by alleviating timing issues with the FDOT funding. 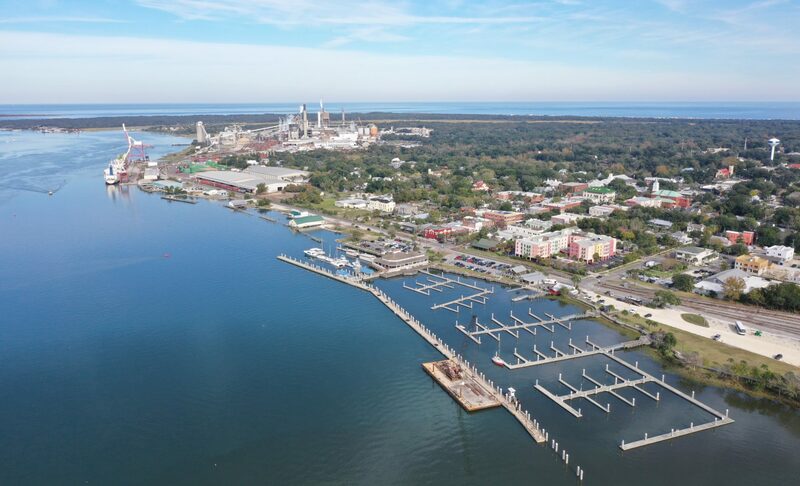 Christopher T. Ragucci, Chief Executive of Worldwide Terminals Fernandina remarked, “We continue to believe that Nassau Terminals is an undiscovered gem in the growing Southeast region. The acquisition of this Crane will support the continued growth of our Port operations. We are grateful to Governor Scott and appreciate the dedication of Senator Bean and Representative Byrd to the growth of world trade and the economy in Nassau County. I would also like to take this opportunity to thank our financial and equity partners in WTF, Four Wood Capital Partners, who arranged this innovative financing on behalf of OHPA”. John M. Morale, Managing Partner at Four Wood Capital Partners who also serves as WTF’s Vice Chairman, Treasurer and Secretary commented, “We are pleased to work with a premier financial provider such as BB&T to secure the necessary funding for this project on behalf of our colleagues at OHPA. This transaction is a part of the first phase of our capital improvement plan for the Port which will bring more jobs and greater economic growth to Nassau County. Further, we also note that we are in the process of finalizing a new long-term Operating Agreement with OHPA which we hope to have executed by October 4, 2018”. 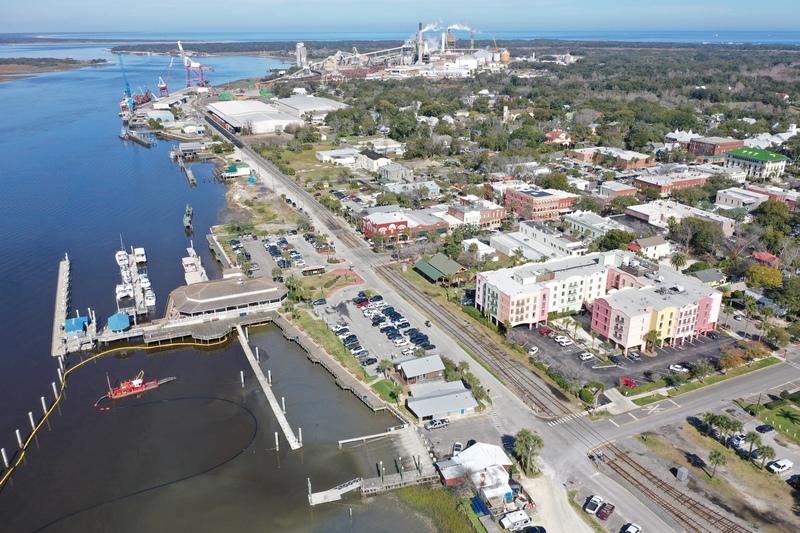 The Port of Fernandina’s Operator, Nassau Terminals, LLC, was acquired by Worldwide Terminals Fernandina, LLC, a subsidiary of the Worldwide Group, LLC, and Four Wood Capital Partners, LLC, a New York based asset management and merchant banking firm in February 2018. The terminal currently handles paper and forest products exported to the Caribbean, Central and South America by companies such as Barnett Paper, WestRock and Caribbean Forest Carriers. It also serves as homeport for Somers Isle Shipping’s containerized service to Bermuda, now in its 33rd year. The terminal handles imported forest products from Asia and Scandinavia, as well as, certain bulk commodities. 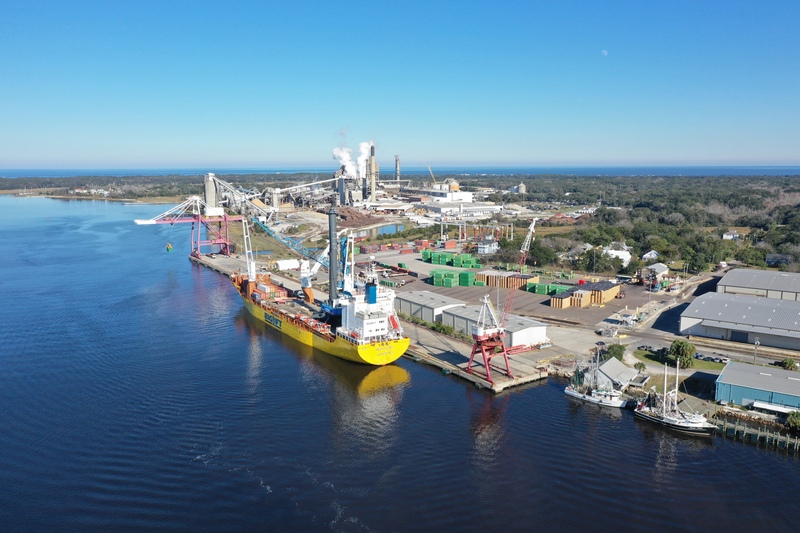 Plans call for an additional capital investment of $15 million in the coming years to modernize the Port’s facilities including additional cranes and cargo handling equipment, as well as, a berth extension and an on-dock paper warehouse to better accommodate our customers. The Port has 300,000 square feet of warehouse facilities and daily on-dock rail service. It has a fully-certified Container Freight Station, and the Port will be adding Foreign Trade Zone designation as well. Worldwide Terminals Fernandina has an experienced workforce that offers turn-key services including freight-forwarding, trucking, warehousing and distribution management and is capable of handling bulk, break-bulk, project cargo, containerized and refrigerated cargoes, as well as, steel and lumber. 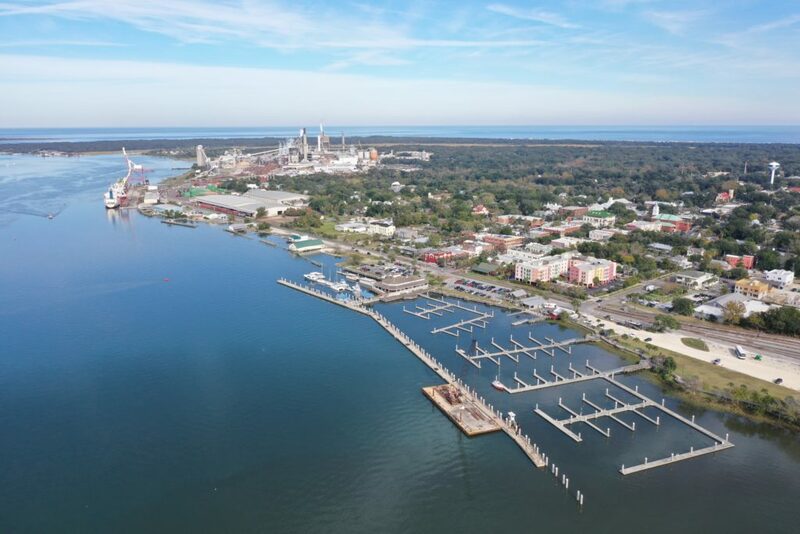 Worldwide Terminals Fernandina is an ideal multi-purpose port, located less than two miles from the open ocean, offering the most cost-efficient service in the Southeast region. The Port currently has active trade with South America, the Caribbean and Bermuda, with plans to expand into Europe and Asia over the next year. BB&T Corporation is a bank holding company based in Winston-Salem, North Carolina. Its bank, BB&T, operates 2,049 branches in 15 states and Washington, D.C., and offers consumer and commercial banking, securities brokerage, asset management, mortgage, and insurance products and services. It is the 16th largest bank in the U.S. with assets of $221.6 billion. Its subsidiary, BB&T Insurance Services, is one of the largest insurance brokers in the world. Please contact either Chris Ragucci (904.990.1400); chris.ragucci@worldwideterminals.com) or John M. Morale (646.515.7561); john.morale@worldwideterminals.com) with any questions or for more information. 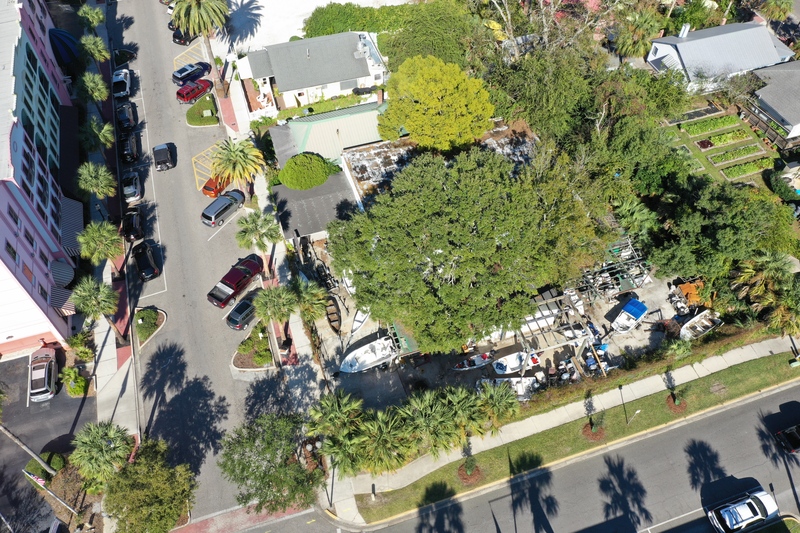 Small cruise ships, a rebuilt marina, luxury townhomes, remodeling of the Baptist Sunday School building, a downtown putt-putt, brewery, a new location for the distillery, apartments on Atlantic at a formerly blighted corner and a mystery project at the old “Boat House” are projects underway. All are slated for 2019/2020 completion and should be very positive additions. Creative vision by the buyer and persistence by the broker resulted in the sale of a Historic District fixture, “The Boat House”. While I have seen many of the redevelopment details, plans can change. 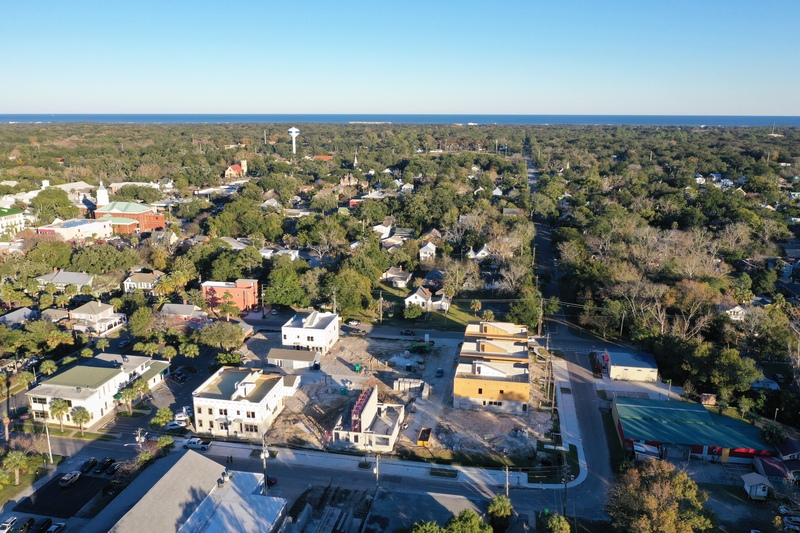 I will say the plans look exceptional and will bring an exciting addition to Downtown Fernandina. Across from City Hall, this is one of the last large sites with a view, plentiful nearby parking and almost directly across from the Hampton Inn and Suites on 2nd Street. If you’re looking for a broker with experience and persistence, give me a call during or after hours. With experience selling a variety of area commercial properties, I’m more than happy to assist or offer a second opinion. Some past closed sales or listings include sites like the new Dollar General on SR 107, Reflections of Nature’s new site on Arbor Lane, 316 Centre Street (being redeveloped), 30 South 2nd Street and the former Pecan Roll at 122 South 8th Street. I hope I’m competitive with service and rates, but let me know what you need. 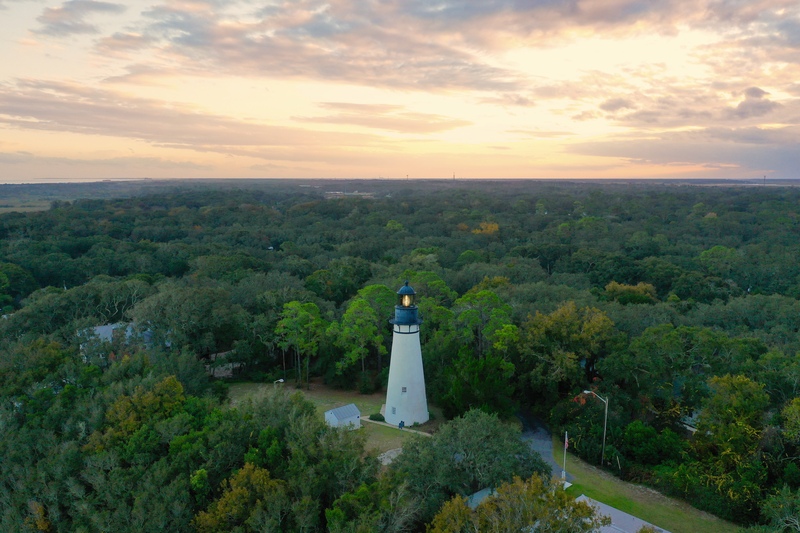 In 2018, I added a commercial drone license to improve client service, offer more frequent updates and, more than you might imagine, inspections of more inaccessible locations. It is also becoming an enjoyable way to promote the diversity here on Amelia Island. Preservation and Affordable Housing Related? Periodically, I have a conversation with someone about development and offering incentives instead of taking away value from the landowner/investor. In talking with a friend earlier today, we both agreed it would make so much sense to move density from one property to another. I brought up one developed property and the loss of affordable potential after years of delay eliminated more and more of the profit. If only “incentives”, not obstruction, had been a part of the conversation! TDR stands for “Transfer of Development Rights”. Consider a purchase of one property by one developer or by the city. That property might have a certain number of units in density. If you create a mechanism to bank that total density and offer it as either an incentive to that developer or another property owner, you could either sell those units of density, bargain with them to incentivize affordable housing or accomplish another goal. The key is avoiding a cost to the taxpayer, while incentivizing a change. The dark and light green areas represent either park or conservation areas. Consider the cost of land and limited tax dollars. Doesn’t it make sense to consider alternatives to do the same thing? 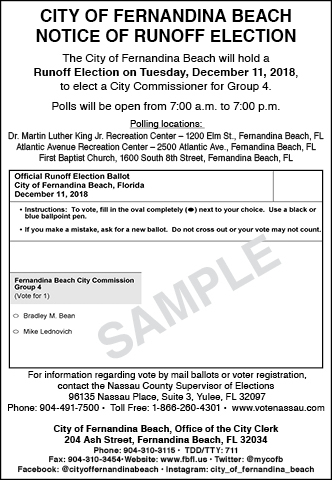 If you don’t know me, I’m a former Commissioner and Mayor here in Fernandina. I’ve known Bradley’s family for most of my life and they have a long history here in local business and in political life, but that has nothing to do with my endorsement. My reasoning is below, but I see Bradley frequently. Usually he’s in the local YMCA at the same time. I met him long before he decided to run for office and immediately liked his demeanor. He impresses me as fair and honest. He impressed me as genuine, sincere, respectful and exactly the kind of personality I would want to see in local government. History is a factor for me. Bradley is a native and at least third generation island resident. 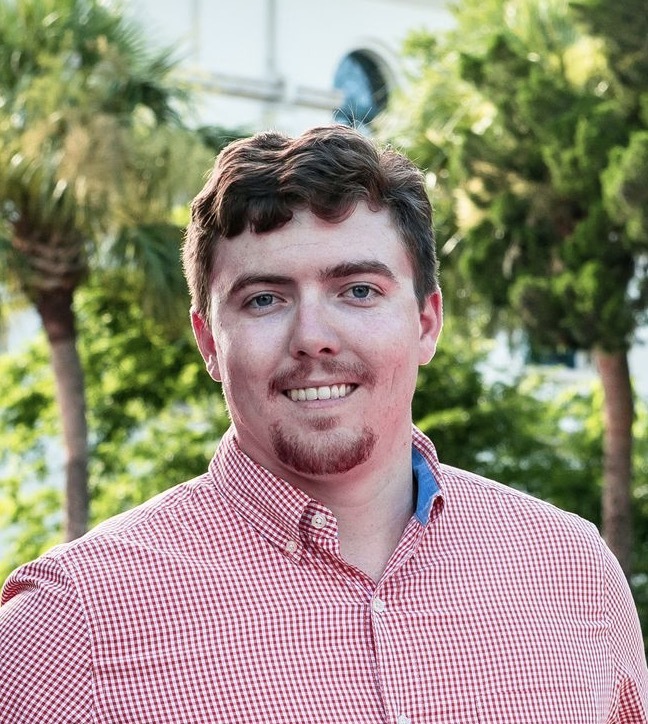 He cares about his family, ranging across all age brackets, but he also has ties with graduation as “Valedictorian” of Fernandina Beach High School and many local friendships. Yes, his father is a politician. You’d need to be blind not to see the name and associate it with Aaron Bean, our State Senator. I see this as an advantage for Nassau, given the obvious tie and invaluable insights offered to a son. Eduction is a factor. 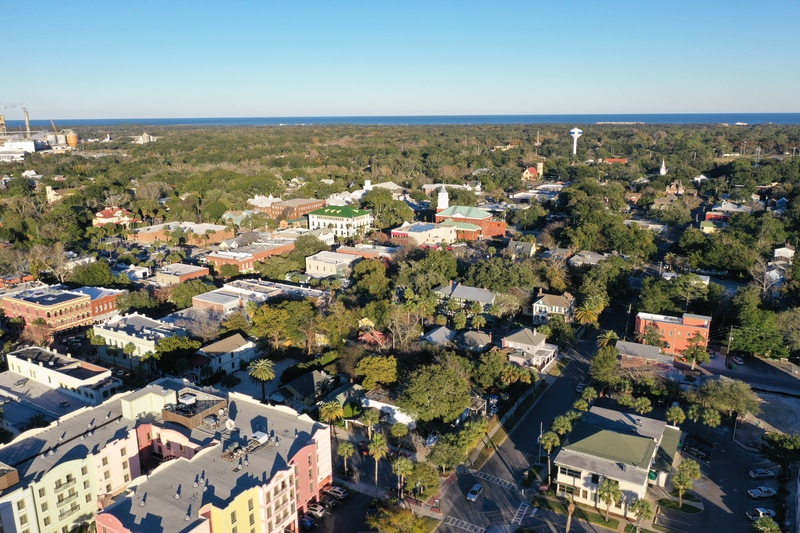 His industrial engineering degree from the University of Florida will offer insight into issues like the marina, road maintenance needs, beach re-nourishment, drainage and more. Many issues are land use issues, but many issues in front of a commission have more to do with being reasonable and being able to plan for keeping the city running smoothly. Maintaining this or anticipating the cost is important. Any background with land use, construction, engineering or business, lends itself to the position. Employment is a factor. Bradley works full-time for a local mill. Whether people recognize this or not, we are still a working community in significant proportion. Rayonier, WestRock, Lignotech and the Port of Fernandina employees are significant. If you count retirees and current employees, there is a need to find a voice for jobs and economic diversity. Our biggest issue on the island is in keeping this diversity alive. Our healthy economy is more resistant because we are not singularly dependent upon tourism, unlike many small coastal Florida cities. Involvement is a factor for me. I won’t name his opponent, but promising to be “full-time” is definitely not a good thing. Understanding the position is meant to be representative, not supervisory, is important. Often commissioners become hyper involved in meetings with staff or in a role stepping on or over the boundary defined in the charter. Bean understands this. I believe the position of staff attorney came after a commissioner in years past spent “MANY” hours camped at a local attorney’s office billing the “research all my questions” time to the taxpayer. No, running as a commissioner is not the same as City Manager. The commission as a whole can give direction to a manager. Individual commissioners or even a Mayor cannot. The elected position as a city commissioner is meant to offer representation. Voters should see people in office reflecting the local demographics and ages. We’ve had poorly prepared commissioners and commissioners promising to be “full-time”. We have commissioners professing to have experience or be more entitled to a position. As a former commissioner, I believe we need people willing to learn and able to reflect the voter’s views. Some run with negativity, insulting their opponents and some simply ask for your vote. We never want someone attempting to be a “full time commissioner”. This usually means they’re interfering in the day-to-day management of the city. We have a government with 5 commissioners and a Mayor with mostly ceremonial power. He or she is not entitled to any more voice than other commissioners. So, that said, I hope you consider diversity, education, understanding the limits of the position and long history here on the island when you vote. My vote is going to Bean and I hope you’ll join me.